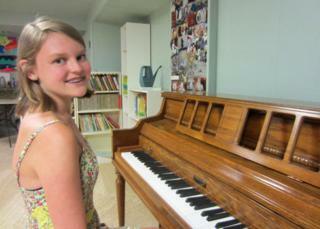 Alana Saarinen loves playing golf and the piano, listening to music and hanging out with friends. In those respects, she's like many teenagers around the world. Except she's not, because every cell in Alana's body isn't like mine and yours - Alana is one of a few people in the world who have DNA from three people. "A lot of people say I have facial features from my mum, my eyes look like my dad… I have some traits from them and my personality is the same too," says Alana. "I also have DNA from a third lady. But I wouldn't consider her a third parent, I just have some of her mitochondria." Mitochondria are often called the cell's factories. They are the bits that create the energy all of our cells need to work, and keep the body functioning. But they also contain a little bit of DNA. Alana Saarinen is one of only 30 to 50 people in the world who have some mitochondria, and therefore a bit of DNA, from a third person. She was conceived through a pioneering infertility treatment in the USA which was later banned. But soon there could be more people like Alana, with three genetic parents, because the UK is looking to legalise a new, similar technique which would use a donor's mitochondria to try to eliminate debilitating genetic diseases. It is called mitochondrial replacement and if Parliament votes to let this happen, the UK would become the only country in the world to allow children with three people's DNA to be born. Alana was born through an infertility treatment called cytoplasmic transfer. Her mum, Sharon Saarinen, had been trying to have a baby for 10 years through numerous IVF procedures. "I felt worthless. I felt guilty that I couldn't give my husband a child. When you want a biological child but you can't have one, you're distraught. You can't sleep, it's 24-7, constantly on your mind," she says. Cytoplasmic transfer was pioneered in the late 1990s by a clinical embryologist Dr Jacques Cohen and his team at the St Barnabus Institute in New Jersey, US. "We felt that there was a chance that there was some element, some structure in the cytoplasm that didn't function optimally. One of the major candidates that could have been involved here are structures called mitochondria," he says. Cohen transferred a bit of a donor woman's cytoplasm, containing mitochondria, to Sharon Saarinen's egg. It was then fertilised with her husband's sperm. As a little bit of mitochondria was transferred, some DNA from the donor was in the embryo. Seventeen babies were born at Cohen's clinic, as a result of cytoplasmic transfer, who could have had DNA from three people. But there was concern about some of the babies. "There was one early miscarriage, considering there were twelve pregnancies that is an expected number," says Cohen. He and his team believed that miscarriage occurred because the foetus was missing an X chromosome. "Then there was another twin pregnancy, where one [of the twins] was considered entirely normal and the other had a missing X chromosome. "So that's two out of the small group of foetuses that was obtained from this procedure. This did worry us and we reported that in the literature and in our ethical and review board that oversees these procedures," he says. At the time of birth, the other babies were all fine. A year or two later, another of the children was found to have "early signs of pervasive early developmental disorder which is a range of cognitive diseases which also includes autism." Cohen told me. He says it's difficult to know if the abnormalities happened by chance or because of the procedure. Other clinics copied the technique and Cohen estimates that around 30 to 50 children worldwide were born who could have DNA from three people as a result. But in 2002 the American regulator, the FDA (Food and Drug Administration) asked clinics to stop doing cytoplasmic transfer due to safety and ethical concerns. All of them did. "There was a reaction from scientists, ethicists, the public at large, I think most of it was supportive, some of it was critical - I think this is normal, every time an experiment is done in medicine there is a reaction - what are the risks here?" says Cohen. At the time, some were concerned because they felt this was germ line genetic modification. What "germ line" means is that a child like Alana would pass her unusual genetic code down to her children. And their children, would pass it to their children and so on. Because we inherit our mitochondria only from our mothers, only female children would pass their unusual genetic code on. Crossing the germ line as it is known has never been done before so very little is known about what the outcome could be. Due to a lack of funding, Cohen says, it hasn't been possible to find out about how any of the children like Alana who were born from cytoplasmic transfer are doing. But the St Barnabus Institute is now starting a follow up study to check their progress. "I couldn't ask for a better child. She is an intelligent, beautiful girl inside and out, she loves math and science … she does really well in school. She helps me around the house… when she's not texting!" "She has always been healthy. Never anything more than a basic cold, or a flu every now and then. No health problems at all." The health of the children, like Alana, born from cytoplasmic transfer is under scrutiny now because of the UK's decision to consider legalising mitochondrial replacement, where the mitochondria of a donor woman will be used to create a child. It would not be available for people with fertility problems but for those who carry diseases of the mitochondria and would otherwise pass down these genetic abnormalities to their children. Exactly how it is done still needs to be determined as there are two ways of doing the procedure, depending on when the eggs are fertilised. "Mitochondrial diseases tend to involve tissues or organs which are heavily dependent on energy," says Prof Doug Turnbull from The University of Newcastle. He has treated people with mitochondrial disease for decades and is one of those who has developed these new techniques to try to cure these debilitating diseases. "The conditions can therefore involve the heart, the brain or sometimes the skeletal muscle," he says. "People can have very bad heart problems which can cause the heart to fail eventually, they can be very weak and require respirators or be in a wheelchair. With the brain, they can get epilepsy, strokes and eventually severe dementia." Turnbull estimates that around 1 in 3000-5000 people in the UK have a mitochondrial disease. "We can treat the symptoms. We can improve the quality and length of peoples' lives but we can't cure them." The mitochondria carry some DNA, around 13 "important genes" says Turnbull. That compares to the "23,000 important genes" in the nucleus where most of our DNA is held. This is the DNA that determines our traits and personality. "We're not trying to create some characteristic that makes this person a stronger person or [someone who] will have blonde hair. We're trying to prevent disease and I think that is the only justification for doing this," he says. Sharon Bernardi, from Sunderland in the North of England, is someone who mitochondrial replacement could have helped. Bernardi has lost seven children to mitochondrial disease. "I have babies in three different cemeteries," she told us in her sitting room, surrounded by photographs of all her children. "That is not the way you plan your life when you're trying to have a family. I have lovely photos and lovely memories but obviously that's all I have got now." The doctors didn't know why Bernardi's babies kept passing away only hours after they were born. So that's why she kept trying, hoping she would have a healthy child. With her fourth child, Edward, at first everything seemed different. He was healthy until he was about four and a half. But it was then that he was diagnosed with Leigh's disease, a type of mitochondrial disease, and his health deteriorated throughout the years. "From the age of 20 Edward [found] getting around more difficult. He started to get new symptoms - spasms. He'd start screaming... four, five, six hours at a time. His muscles used to tense up, his hands, his face. It was like dystonic spasms - a really bad spasm. [For] eight hours he'd be in pain, screaming. His face would twist up and his hands would get really stiff. It was hard to see." Edward Bernardi passed away three years ago, when he was 21. "My life was totally for Edward. Even now sometimes if I have gone to sleep, I still wake up, and think, 'It's very quiet.' I have to slip back into reality and think, 'Don't be silly, Edward's not there. He's not in his room'." "Without a heartbeat I would have gone for this [mitochondrial replacement]. I hope this is a new option. I hope people take it seriously and it's approved. "I don't want my son to have just died for nothing. I want him to have made a difference." "His life was robbed at 21. We're trying to stop this. People have to understand this is a life disease. We're trying not to pass it on to children and make it better for future families." But some people believe this technique could set us on a slippery slope towards genetically modified humans. "These regulations would authorise the crossing of a rubicon for the first time. It would authorise germ line therapy... to alter the genes of an individual. This is something defined by the EU Charter of Fundamental Rights as effectively constituting eugenics," says British MP Fiona Bruce who chairs the All Party Parliamentary Pro-Life Group. "We will have approved a technique and what that technique could be used for in the future who knows. We're opening a Pandora's box." The regulator in the UK, the HFEA or Human Fertilisation and Embryology Authority, has held three independent reviews to scrutinise the safety of this technique. The conclusions were that mitochondrial replacement is "not unsafe". That means "it would be reasonable, with some additional experiments, to take it into clinical practice if all circumstances are fulfilled" says Peter Braude, emeritus professor of obstetrics and gynaecology at Kings College London. He sat on all three HFEA scientific reviews. "In any move from science to clinical practice there is a leap of faith - it has to be done," he says. He adds that many of the concerns being raised now about this are the same as the ones cited in the early days of IVF. The UK has for decades been a leader in assisted reproduction science and is where the world's first test tube baby, Louise Brown, was born in 1978. "The headlines then were 'playing God' and 'genetically modified humans'," says Braude. "There have been few episodes I'm aware of in the history of assisted reproduction that have had to be stopped because of hazard. It's all gone pretty swimmingly as far as I'm aware." Braude says that mitochondrial replacement has gone through much more scrutiny than previous, now well established, assisted reproduction techniques did, such as IVF. "Whereas the original techniques were used with only [experiments from] mice, rabbits, lab animals... the big difference here is we also have issue of human embryos and this work has been tested in macaque monkeys in primates. All those were very useful, reassuring… hence why we came to the conclusion that this is not unsafe." The experiments done on macaque monkeys were done in Oregon, US and the monkeys are now five years old and seem to be healthy. Braude also points out that having a third person's DNA in your system is "nothing particularly new". "Think about bone marrow transplants, let's say unfortunately you have leukaemia and you have to have your bone marrow radiated for the cancer to be killed and then it is replaced by bone marrow from someone else - say me. Effectively from that time onwards, you will have circulating in your body DNA from me. You won't be related to me, you may be grateful to me, but you will have DNA from a third person circulating in your body." What is different, say critics, about mitochondrial replacement, is that DNA from the donor will be passed down future generations. Dr Ted Morrow, an evolutionary biologist from the University of Sussex, and colleagues have carried out mitochondrial replacement experiments on other animals. He raised safety concerns about mitochondrial replacement to the scientific reviews. "For mice, there were changes in cognitive ability... to learn and do things using their brain. In fruit flies and seed beetles there were changes in male fertility, changes in ageing, a range of different traits were effected in various experiments," he says. The HFEA's scientific reviews dismissed Morrow's findings as not relevant to humans because they were done on inbred animals. Morrow stands by his research and says the scientific panels should not have dismissed his findings so quickly. It is Morrow's evidence that critics such as Fiona Bruce cite when saying this technique is not safe enough. She has called a debate in the House of Commons today to discuss mitochondrial replacement. She does not believe there has been enough debate about what the UK is proposing to do. "The technique itself could allow the child to inherit untried untested medical complications," she says. Morrow says that all the coverage of his research has been "a rather odd experience". "In the press it's sometimes portrayed that the scientists think this, and the pro-life group this. I'm a scientist but I'm not a pro-lifer. I think this is a genuine safety concern - that's it." Alana and Sharon Saarinen have been watching the debate in the UK with interest. "I wish I could meet her, the donor, to tell her I am so grateful for what she did for us. How can you thank someone for giving you a life? That's impossible," says Sharon. Alana agrees with her mum. "I think it would be nice to thank her. But I wouldn't want to have a relationship or connection with her. The DNA I have of her is just so small." "I know she might have another person's mitochondria, [but] look what a great person she turned out to be, and healthy. Just because she'll pass it on to her children it won't bother me in the least. I know it was the right thing to do. I have the living proof every day to see how great it turned out."